Well we woke up really late this morning and it was our car pool week which means I ran out the door without any lunch. 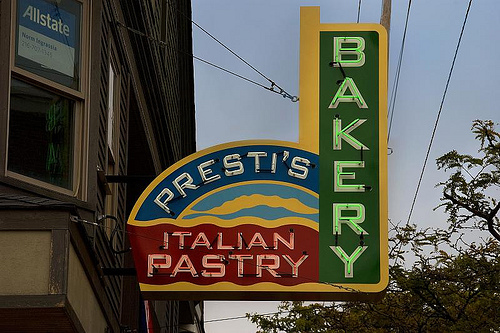 The good news is that I had nothing scheduled at noon and the sun was shining so I headed out to Presti’s for lunch. I have been there probably dozens of times over the past 5 years and always get the same thing: a piece of artichoke pizza and a piece of pepperoni and sausage pizza. Today was no different but was a bonus in that I got to sit outside in the sun all by myself and enjoy the tasty treats. Life is good and pizza makes it even better. Previous Previous post: Eat Out: Washington D.C.